Anthony Quinn as Zorba the Greek - often imitated, never bettered! 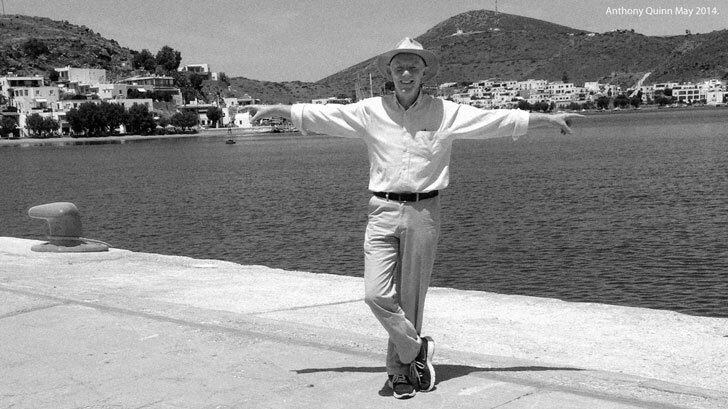 The famous scene in which Anthony Quinn's character dances the 'Sirtaki' was in fact filmed in the early 1960's on the beach of the village of Stavros in Crete, but you will see this scene re-enacted at any one of the Greek islands! Anthony Quinn is well known for playing the role of a Greek man in many films, and when filming 'The Guns of Navarone' on the island of Rodos (Rhodes) he bought land just south of Faliraki, now known as Anthony Quinn Bay. However this land was reclaimed by the Greek Government following a change in Greek property law in 1984. 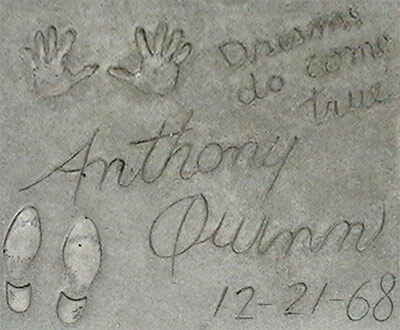 Anthony Quinn's footprints, handprints and motto 'Dreams come come true' embossed into the concrete outside Graumans Theatre in Hollywood, California USA. December 1968.